The Daily News: Cuppa Joe Heads Up!! 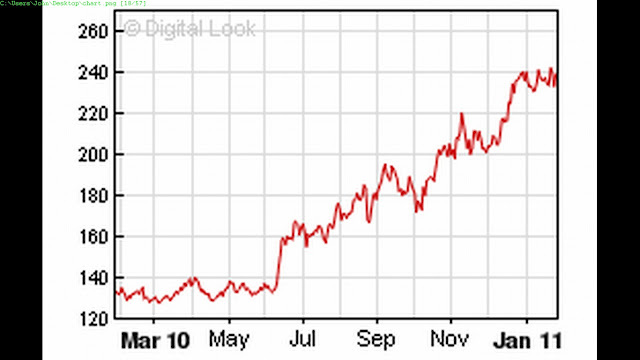 Above is the Coffee Price Chart. Gee, is it going up? Well, YEAH! Will it continue to go up? Yep, you can bet the farm on that. For some odd reason, coffee prices haven't fully "digested" this steep increase. You can still buy a big can of coffee for roughly the same price you did last year this time. Well, guess what? Them's the Good Ol' Daze. Ya'll betta git yerselfs out to your local market and stock up with as much coffee as yer budget can afford. The above chart tells me coffee prices are heading to the stratosphere. What's now a six buck big can of premium coffee will soon be far more expensive. Buy it cheap while you can! ALOT of their coffee last year due to drought.